Two should be your No. 1 stop during Valentine&apos;s Day season - or really any season. 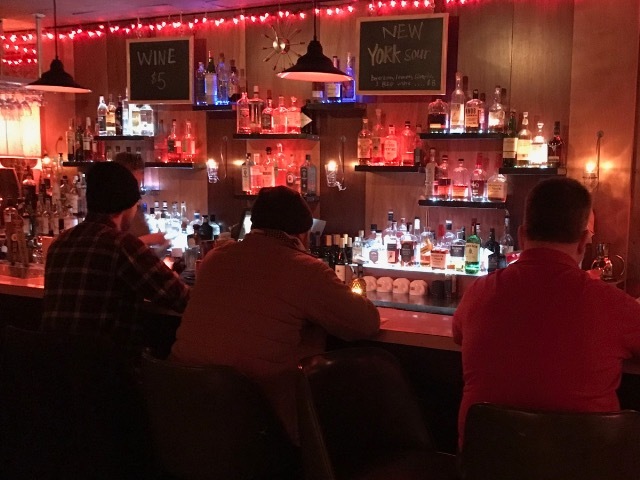 Published Feb. 8, 2019 at 7:16 p.m.
Every year, the OnMilwaukee's best of bars poll, includes a seemingly simple question: What's the best bar for a first date? But what makes a bar romantic? Sure, an intimate space and mood lighting can help – but isn't it the company you're with that turns a typical drink at a bar into a swooning, special evening? For those looking for a place to jump start one's heart, however, it doesn't hurt to stop by a place with its roots planted in romance – which is quite literally the case at Two, found at 718 E. Burleigh St.
That was the premise when owner Don Krause first opened the Riverwest lounge in 2008, renovating the former Hop Inn space, a classic pool and darts dive bar, right next door to his other high-concept watering hole, Art Bar. While the Hop Inn had a solid following for pool – "People went there for serious pool playing," Krause recalled, joking that he still hears about axing its impressive billiards table – he had a different idea for the cozy space: a hideaway for couples. 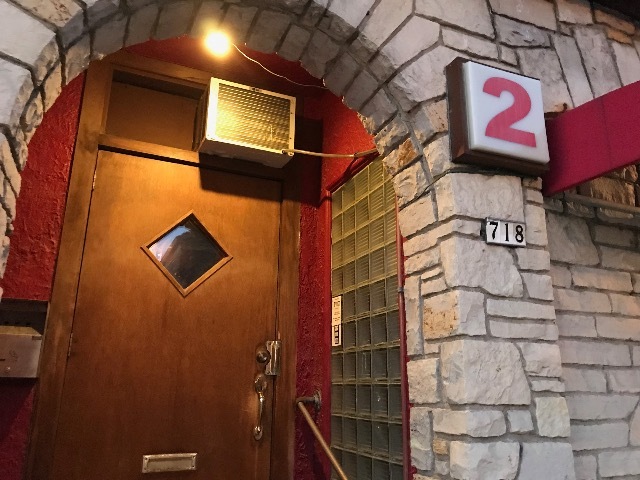 In the early announcements a decade ago, Krause called it "a lounge for lovers" and "Milwaukee's make-out bar" with a pairs-minded name to match: Two. The reality of the name, however, was a little less romantic. "There wasn't a lot of space for a sign," Krause laughed. "It had just became my second bar, so I said I'd just call it Two." The name outside, though, perfectly fit the couples-centric concept inside: an intimate space, decorated with passion red walls and a jukebox filled with love songs, able to fit maybe 38 people – many of those tucked away in the bar's signature "kissing booths," cozy nooks for couples complete with beaded curtains for maximum privacy. "They're stimulating for people who want to be intimate," Krause explained. "It was something I saw in Europe on my travels, where a lot of the bars are really small in Amsterdam and Germany. They even had backrooms where you could venture in to." "It just offers a nice little getaway to hang out and talk – especially because we do have a lot of neighborhood people that are here, so maybe you don't want to see people and just want a private night," said Alison Lechner, a bartender at Two for five years. "It's just nice to step away and be left alone." "What happens at Two, stays at Two" was the mantra of the secretive speakeasy – with an unlisted phone number to match. "It was meant to be a hidden gem," Krause said. "I didn't want to draw a lot of attention to it. I didn't want to advertise it very much. I really didn't even want to have a Facebook … I remember the days when you found a new bar, you went there. You didn't look it up on Yelp; you just found it the old fashioned way. I wanted people to discover it." That process, Krause admits, took longer than preferred – partly because many took the somewhat tongue-in-cheek couples concept more seriously and severely than expected. "A lot of people thought you couldn't go there without another person or that you couldn't go there as a group of four or six," Krause said. "That concept started to bother me, that people were reading it that way." As a result, Krause gave Two a conceptual facelift, de-emphasizing the "hot-and-heavy" hook and making it more of a complimentary low-key companion to next door's Art Bar, sharing similar drink specials – including Wine Wednesdays with $5 glasses and $3 Lakefront beers on Thursdays – while offering more in terms of craft cocktails and liquors, as well as a quieter, cozier and more conversational space, especially when its neighbor hosts concerts, gallery nights or other special events. The bar itself received a physical facelift, as well, removing some of the kissing booths and lounge chairs in favor of some traditional booths and high-tops better for groups, nudging the focus away from couples and more toward conversation and community. "I wanted it to be an alternative to leaving the neighborhood and going somewhere else," Krause said. "Sometimes if there's a loud band or a comedy act at Art Bar that doesn't necessarily agree with you, it's a place to escape to rather than having to get into your car." Two also added a small porch and smoking area in the alley space in between the two bars. One thing Two didn't add, however, during the renovations? A television – a rarity in today's hyper-connected, sensory-and-screen overload modern times. "We just wanted to take that distraction away so people would talk again," Krause explained. "You still have people that go out and then they sit on their phones all night, not really socializing. But at Two, you get into an environment where you can put it away and be a person again." After a decade of transformations, Two has perhaps found its ideal form, a place of comfortable contradictions. It's a bar that looks like a dive from the outside but immediately feels like a warm, almost luxurious lounge inside as soon as one walks through the door. 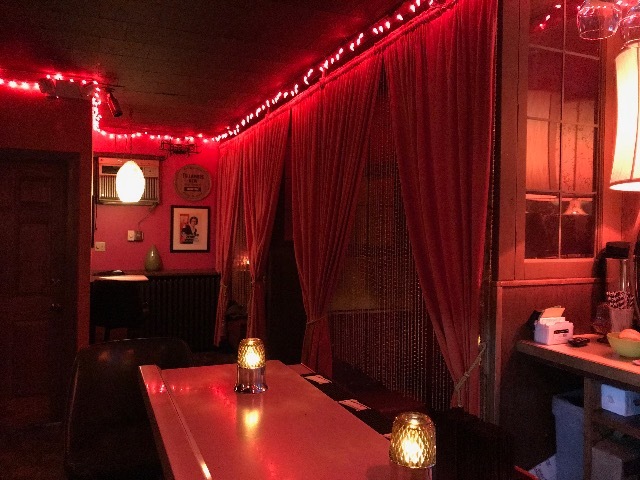 It's exceptionally intimate yet also very inviting, perfect for privacy but also perfect for being public, meeting new people and sparking spirited conversation with strangers turned friends. The vibe is close-knit like a neighborhood spot, with those tending bar knowing regulars and their drinks by name, yet welcoming to newcomers instead of alienating as some corner taps can risk. What started as a bar for couples has successfully evolved into a bar for everyone. "I've been to every bar in the neighborhood, more than once, and I never really called any of them my home base. I didn't really feel attached to them to the degree that I'd say, 'That's my bar,'" Krause said. "So I wanted to make an environment that I want to hang out in, where I don't feel like I'm the oldest or youngest person there. I wanted a place that brought everyone together and create some diversity." "You can always have a good conversation with anybody here – which I really love about Riverwest," Lechner said. 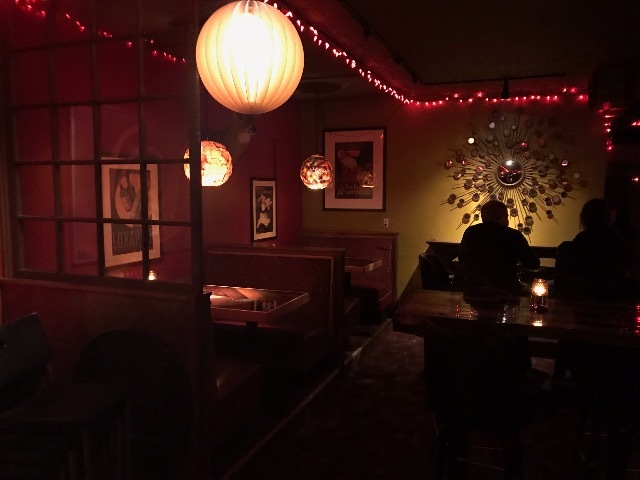 And for couples looking to kanoodle, Two's swooning, smooching heart still beats; a pair of its original kissing booths survived the renovations, still providing a curtained getaway inside this already cute hideaway. But the real key to connection at Two isn't in offering a place to lock lips; it's in offering a place to luxuriate in company, whether someone you came in with or someone you just met. Because it's who you're with, not where you are, that makes a great night. That's what truly makes Two the perfect place to fall in love – whether with someone special or just with the bar itself.